. 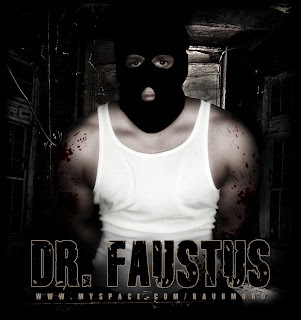 Faust, in the story Dr. Faustus, represents those that choose to stoop to a lower level in order to get what they want. The good angel and the bad angel are the morals that pull the Faust's soul apart, forcing him to make a decision that can effect his future. The story Dr. Faustus is a great example of how one wrong decision can cause an everlasting burn. In the story Dr. Faustus, there is a battle of good versus evil going on. Faust is a man who is desperate for power and control. He wants to do anything he wants to do, and control anything he wants to control. That is where Mephistophales, a blood-sucking devil appears, preying on Foust and his confusing soul. Mephistophales was in heaven, and was kicked out. His soul is burning, and so he is desperate to take Foust's soul with him. Misery does love company. Faust wants power when he states "I charge thee wait upon me whilstg I live. To do whatever Faustus shall command". (Act 1, scene 2,lines 33-34). While Faustus demands his power, Mephistophales is miserable in hell. He wants Faust's soul, and the two make a trade. Meanwhile, the good angel appears. The good angel is trying to convince Faust to drop this insanity, because the bible is what he should be reading, rather than the magic book. When it seems like the angels have gotten to Faust, the devils appear. It is an insult to the bad angels to hear Christ's name in their presence. While the good angels are telling him to repent, the bad angels are giving him a taste of pure hell. (p48) They bring out the seven deadly sins. (48) Lucifer, in the meantime, worked his magic, and Faust signs the dotted line. It is over. The seven deadly sins represent the agony of hell. Faust now became the eighth. He now became just as evil and manipulative as Mephistophales. He now was forever damned. Temptation is society's worst enemy. When challenges arise, everyone wants answers, even if that means taking the wrong route. A great example of Faust in our society is robbery. Although most robbers know that it is morally wrong, despair for money and control turns their soul to the devil, who is ready to take advantage. After all, going to prison is like going to hell. That is the price they will pay for allowing the devil's spirit to creep inside them, and let their souls burn forever. In this essay the critical approach on (Mythological and Archetypal Approach) played a big role in forming my opinion of the signet classic book, "Doctor Faustus" It is to my knowledge that mythology does not meet our current standards of factual reality, but unlike the 16th century which this play was presented, men like Faustus saw myth as fundamental and a dramatic representation of the deepest instinctual life in the universe. This play is about how Faustus puts on a performance for the Emperor and the Duke of Vanholt. The main thesis or climax of this play is when Faustus two friends Valdes and Cornelius who are magicians, teaches him the ways of magic. Faustus uses this magic to summon up a devil named Mephistophilis. Faustus signs over his soul to Lucifer (Satan), in return to keep Mephistophilis for 24 years. We also see what happens when magic power gets in the wrong hands when Mephistophilis punishes Robin, who is a clown and his friend Ralph for trying to make magic with a book they have stolen from Faustus. In the beginning angels visit Faustus, and each time he wonders whether or not to repent, but the devil appears and warns him not too by tempting him of magic to posses. In the end of the play the two good and evil angels have been replaced by an old man, who urges Faustus to repent? But it is to late for and the play ends with the devil carrying him off the hell. The main reason why I picked this critical approach is because this play has established a significant relationship to archetypes and its patterns. Such things as archetype images played an important role in this play. For example on (page 32, line 8) it speaks of a circle, referring to the protection of Jehovah. As an archetype image it refers to wholeness and unity. Also between (lines 16-24), Mephistophilis wants to put away with the trinity of Jehovah, by saying, "Hail spirits of fire, air, water" and the word welkin on (page 31 line 4). This implies to the first and second images of archetype images. Other major keys that exist in the critical analysis of this play are the number seven, which is said to be the most potent of all symbolic numbers. In the play seven is related to the seven deadly sins: pride, covetness, envy, wrath, gluttony, sloth, and lechery. The most important critical analysis images of archetypes is the Wise Old Man, which is said to carry intuitions on one hand and moral qualities such as goodwill and a readiness to help on the other. In the play the old man showed these exact qualities. This old man appears when the main character is in a hopeless and desperate situation from which only faith and luck can help him. Unlike every other good ending, it was too late for the old man to help Faustus, and he was carried off to hell. The last of the archetypes was the trickster who was portrayed as the Satan or Lucifer in this play. He was the opposite of the wise old man and his primarily a divine being. In closing, mythology plays a universal appeal in so many cultures. It is important to use in so many ways because it gives us morals and direction in life. Different cultures use myths to put order to their society and to have something to dwell on in times of good and bad. Unlike present day we look unto the Bible for the correct way of living. Within the text of Christopher Marlowe's "Doctor Faustus," a reader notices the struggle between the superego and the id. Throughout the play, Faustus struggles with himself while Lucifer and Mephistopheles struggle with him. Though these huge conflicts take place in the text they aren't the greatest of situations when one tries to apply the psychoanalytical approach. The most obvious situation arrives with the introduction of the Seven Deadly Sins. They represent the constant struggle between the id and the superego. They add to the seduction of Dr. Faustus and the constant struggle in a chaotic Hell. The id possesses most of the sins: Pride, Covetousness, Envy, Wrath, Gluttony and Lechery. All six of these sins show characteristics that are strong and powerful. Though these sound as if they were good characteristics, they are actually extremely over-bearing. When the sins explain who they are, they don't leave any room for argument. They just say who they are, and they take what they want. For example, Pride explains what he can do with a woman: "I can creep into every corner of a wench: sometimes, like periwig I sit upon her brow; next, like a necklace I hang about her neck; then, like a fan of feathers I kiss her..." (Marlowe, II.ii.120) Obviously, Pride feels powerful enough to take any woman he wants and perform with her any way he wants. With a sly and mischievous voice Pride states what he can do and no one can change it. Another great representation of the id is Lechery or lust. Lechery just walks out and struts her stuff in front of Faustus. The reader realizes that her power is not in her words but in her presence. Even Lucifer notices her strength because he sends her away almost as fast as she comes in. "Away, to hell, away! On, piper!" (Marlowe, II.ii.177) Lechery closes the deal on Faustus. Her presence is so powerful that Faustus returns to the hands of Lucifer. All six of these Seven Deadly Sins show their strength and power, for they don't back down, except to Lucifer. They do what they want and say what they please, because they are the angels of Lucifer, the most evil angel of them all. In achieving their goals they are very aggressive and Lucifer provides them all the freedom they need in order capture new souls like Faustus. Through this aggressiveness these six sins show their tendency toward the id. On the other side of the seesaw, Sloth possesses no aggressiveness. He would rather sit and sleep than get up and do anything, whether it be talking, bathing or even eating. "Heigh-ho, I'll not speak a word more for a king's ransom." (Marlowe, II.ii.170) He is so lazy that the reader can even see Lucifer getting upset with him. This laziness perfectly depicts the superego. While all the other sins are aggressive, he would rather do nothing. Sitting back and doing nothing would be his way of life. Sloth's characteristics may not be as effective on Faustus, but Lucifer knows that there are other souls that will be convinced one day. At the end of the introduction of the Seven Deadly Sins one easily sees why Hell is in such a chaotic state. It lacks an ego, the balance between the id and the superego. This is the constant struggle in Hell; either there are very aggressive souls or souls that just sit there and do nothing. Both the id and the superego try to steal another soul from Heaven, and these sins fight constantly in order to win over a soul for their mighty Lucifer. Obviously, the more aggressive sins conquer souls that show that balance between the id and superego. Their assertive behavior allows the sins to break down the ego and sway it toward the id where it is much easier for Lucifer to convince them to sell their souls to Hell. The superego, Sloth, mainly persuades those lazy people who seek nothing from life. He goes out and shows that lazy people that the place for them is Hell. In the end, the conflict between the superego and the id is exactly why Hell is the way it is. Because there is no ego, or balance between the id and superego, it creates the chaotic state of Hell. تبدأ الحكاية بمشهد الدكتور جون فاوستوس ( فاوست ) الاستاذ المتبحر في دنيا المعارف والعلوم : استبد به الملل والضجر من حياته الجامعية الجافة الرتيبة برغم أنه ارتقى إلى منصب أستاذ علم الديانة في جامعة وتنبرغ إلا أنه سئم تدريس العلوم التقليدية يزيد فيها ويعيد على مسامع الطلاب حيث لا جدوى ولا غناء عن أحاديث المنطق الشكلي أو عن متون العلوم الطبية الموروثة من دفاتر القدماء. واستفتاء علم الرياضيات في محاولة بغير هوادة لاستحضار روح الشيطان الذي يمكن أن يرضي أهواء البشر ويروي ما يتعطشون إليه من طموحات وأطماع.. كم أمضى الباحث الدكتور ساعات طوالا وهو حبيس مكتبته أو مختبره - يقرأ ويقارن.. يدون ويجمع ويطرح مستخدما تضلعه في اللغة اللاتينية التي تفتح أمامه أسرار ما دونته أقلام علماء وباحثين سابقين وجاء اليوم الذي أوشك أن يقترب فيه من اللقاء مع الشيطان..
لكنه يتلقي زيارة أخرى من جانب أهل السماء.. ملاك الخير الذي يهيب بالعالم الإنسان أن يتوب ويندم عما فعل ويطلب من ربه الغفران بينما لا يتورع الآخر، نذير الشؤم داعية الشر عن تذكير فاوستوس ببريق الثروة وهيمنة السلطة وعظمة القوة والسيطرة التي تنتظره لو واصل المسير.. حينئذ تتركز الأضواء ويسود المكان سحابات تنبئ عن حدث يقع كالنذير..
ـ سأكون عبدا لك.. أقول لبيك وأصبح طوع بنانك في حالة واحدة وهي أن توقع عقدا معنا وتبرم صفقة تكتبها بدمك تبيع بمقتضاهما روحك للشيطان في مقابل أن نتيح لك ما تطمع في نيله من ثروات وسلطات وإمكانات. بدمه السائل مهر الدكتور فاوست عقد الصفقة مع الشيطان.. باع روحه لحساب إبليس أو فلنقل لحساب أطماع القوة والمال والجاه.. بنود العقد تمنح البني آدم فاوستوس وقتا حسبه طويلا - وهو 24 سنة لا غير - يتمتع فيها بما يشتهي وفيها تكون روحه ملكا لإبليس..
ـ هو مو.. فلي ( ومعناها.. أنج بنفسك يا إنسان ) وقبل أن يتمعن مغزاها.. أحاطه شركاء الصفقة الملعونة بمواكب من شياطين الجحيم يهللون ويزينون له فعلته التي باع فيها روحه. ها هو يبدأ مطالبه راغبا في زوجة. ـ الزواج رابطة مقدسة يا إنسان. والشياطين لا يتعاملون مع المقدس.. وكل ما نستطيع تقديمه لك هو عشيقات مجرد عشيقات من لحظتها أدرك العالم الألماني جسامه اللعنة التي بدأت تلاحقه وتحرم روحه من أن تحلق في سموات التطهر والبراءة.. وكلما حاول إبداء التوبة والإنابة أطلق الشيطان مواكب من بعد مواكب كان أهمها موكب الخطايا المهلكة السبع في حياة البشر وهي على الترتيب : الغرور.. الجشع.. الغضب.. الحسد.. الشره.. التراخي ثم الفسوق. ومن مواكب الخطيئة إلى رحلات رتبها الشيطان لشريكه جون فاوستوس طافا فيها معالم أوروبا.. وبعدها طافت شهرة فاوستوس نفسه عبر الأقطار إلى معاهد العلم وبين جدران القصور والقلاع حتى بلغت شهرته إمبراطور ألمانيا الذي استدعاه طالبا منه تحضير روح الإسكندر الأكبر ذي القرنين فما كان من فاوستوس إلا أن اعترف بأن قصاراه أن يستدعى روحا شبيهة بروح الفاتح المقدوني القديم..
واستخدام أساليب السحر إلى أن خلع زوجا من القرون فوق رأس واحد من فرسان الإمبراطور الذي سر مما رأي وقدم لفاوستوس مكافأة مجزية.ينصرم حبل الأيام فلا تجدي المكافآت ولا الثروات تنفع اقتربت الاحداث من نهاية سنوات العقد الشيطاني الاربع والعشرين.. يحاول صاحبنا أن يطلب الغفران ندما فيعاجله الشيطان مهددا بأن يمزق أوصاله إربا إذا أبدى الندم -. تحين الساعة الأخيرة فلا يجدي إبداء الندم فتيلا - يودع فاوستوس زملاءه الاساتذة العلماء معترفا في أشعار المسرحية بأنه أضاع فرصة خلود الروح في عالم المسرة والبهاء الأبدي مقابل متع فانية ومسرات بغير جدوى.. وفي اللحظات الفاصلة الأخيرة يرتفع صوت الدكتور جون فاوستوس يقول:. ـ يا ليتني تحولت إلى قطرة في بحر لجيّ متلاطم.. تغيب في قاعه المظلم فلا يكون لها أثر. لكن هيهات.. اللحظة الموقوتة حانت.. تدق الساعة معلنة منتصف الليل.. تفغر الأرض فاها فإذا بفاوستوس وقد أحدقت به عصبة الشياطين يهبطون ساقطين إلى في القاع في طريقهم إلى غياهب الجحيم. أو على خشبة المسرح يمكن أن يخرج بعدة دروس يرشفها القارئ أو يستقيها المتفرج من رحيق الفن وليس من سطور المواعظ. وأهم الدروس هو الحذر من أن يغتر الإنسان بذاته أو بعلومه أو أن يتعامل مع ظواهر الحياة ومع منجزات البحث والعلم بمنطق الخيلاء المغرور، وفوق كل ذي علم عليم..
وربما يظل الشيطان رمزا للإنحراف بالتحصيل العلمي من خدمة الحياة البشرية بإستخدام منهج البحث إلى تدمير الروح البشري بانتهاج أساليب السحر ( أو الشعوذة ) أو إختزال أهداف الدراسة كي تقتصر على أطماع المال وإستجماع مقاليد القوة وهيلمان السلطان. ويلاحظ أن كل شخوص المسرحية ـ كما رسمها مارلو ـ تخدم غرص تجسيد الافكار المطروحة وتؤدي دورا وظيفيا في شحن المواقف الدرامية.. يحاول فاوستوس إستحضار شخصية الاسكندر الأكبر وهو رمز السلطة والقوة والهيمنة فلا يفلح سوي في إستحضار زوج من قرون الحيوان. نشاهد في سياق المسرحية شخصية هيلين - طروادة بطلة ملحمة الأوديسة رمزا للجمال الكامل والسحر الأخاذ والمتعة الحسية التي لا تقاوم ومع ذلك تأتي اللحظة التي تذوب فيها هيلين مثل شمعة منصهره ثم تختفي لأنها كانت شبحا مجرد شبح بمعنى أن كان جمالها وهما لا يمت بصلة إلى جوهر الجمال. كان مؤلف المسرحية كريستوفر مارلو من رواد إستخدام المونولوج الداخلي - حوار الفرد مع نفسه حيث يبث المتفرجين أفكاره ويكشف عن المكنون المستقر في أعماقه وتلك آلية مسرحية تؤدي إلى تعميق دلالات الحدث الدرامي وقد توسع فيها بإجادة ملحوظة ويليام شكسبير. رغم أنها تحكي قصة تنتمي إلى العصور الوسطى فعلى مستوى الفكر استطاع مارلو أن يضفي على مسرحيته بعدا إنسانيا تجسده فكرة بيع الروح سواء للشيطان أو للحاكم أو لصاحب الثروة أو لحساب هدف مادي بحت من مال أو جاه لا يساوي أن يربح المرء مكاسب. أي مكاسب ثم يخسر نفسه. أما على مستوى الفرجة فالمسرحية تموج بالحركة ما بين تغيير أماكن الاحداث ومرافقة الشيطان في رحلة عبر فضاء قارة بأكملها والتنقل من مختبرات الجامعة إلى قصر الإمبراطور.. فضلا عن مواكب صاخبة لاهية ودقات الساعة الزمنية وما في حكمها من عوامل الجذب والتشويق والإبهار. كريستوفر مارلو ( 1564 ( 1593 - مسرحي إنجليزي موهوب عاصر شكسبير وأبدع أعمالا شعرية ومسرحية كانت تقارن بأعمال الشاعر الانجليزي الشهير بل وتضارعها في بعض الأحيان لدرجة أن هناك من علماء النقد ومؤرخي الادب من لا يزالون حتى أيامنا هذه يذهبون إلى أن مارلو هو الكاتب الحقيقي للأعمال التي تحمل اسم ويليام شكسبير وربما أعان على هذه التصورات حقيقة أن مارلو نفسه كان شخصية تحيطها غلالات من الغموض أو الشكوك..
كان جامعيا وكان مغامرا وكان فنانا وكان طائشا وكان جاسوسا للحكومة وكان مغامرا وكان رائدا في قرض الشعر الانجليزي المرسل (بلانك فيرس ) وفي إبداع المسرحية التراجيدية.. وهناك من دارسي الادب الإنجليزي من يقول بأن مارلو كان يمكن أن ينافس شكسبير لو أمتد به العمر.. ذلك لأن كرسيتوفر مارلو دخل من فرط رعونته في مبارزة حمقاء أودت بحياته وكان في سن التاسعة والعشرين.